Nothing groundbreaking here, but I only realized how helpful a toy dustpan can be when one can no longer bend at the waist! Visit Rocks In My Dryer for more WFMW posts! When your belly is that full of baby, you deserve all the help you can get cleaning up! You crack me up. But look for one of those dustpans with the tall handles and it will be even easier! Better yet...make everyone else do the work! How does that phrase go, "Necessity is the mother of invention." Good inventing! AH - love this idea!!! Gets the job done. Great picture!! Ha! Thanks for sharing- that really made me smile! how cool is that! great for legos, huh? Janice, I'm a germ freak, too. 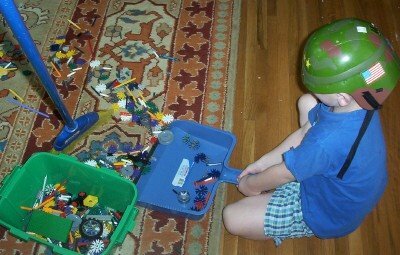 The blue dustpan is specifically reserved for toys! What a neat idea! VERY clever! This reminds me of when I was 8 months pregnant with the son. The daughter was 4 years old. We moved into a new house and I couldn't bend over to unpack boxes. So the daughter lifted things out and handed them to me to put away. Then, when time came to stuff the packing materials into a box and smoosh them down, I'd drop it all into the box, lift her in feet-first and let her stomp down the paper so I could add more. I had my last baby five years ago and I still can't bend at the waist! Yikes! I was reading your tip just as my son was slowly picking up his legos scattered everywhere. I quickly said, "stop and go get the dust pan!" He did and it worked great. We will be using this idea every day! Thanks for sharing.